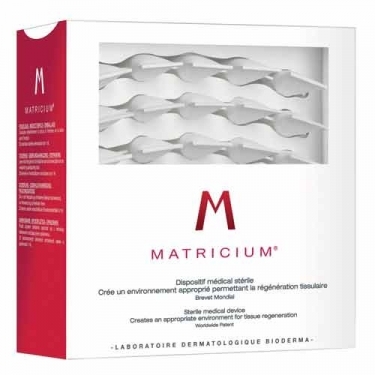 DESCRIPTION: Matricium Dispositif Médical Stérile from Bioderma is a medical device to stimulate cell regeneration. Designed to care for skins that have been subjected to dermatological (laser, peel, etc.) treatments, burns, cuts and irritations (caused by climatic or hormonal conditions), this medical device recreates the ideal cellular environment. It consists of elements found in the skin and essential to its function and regeneration. The skin regains its natural biological functioning and you are given all the resources for a total regeneration. Hypoallergenic and non-comedogenic. No perfume and no alcohol. Apply in the morning and evening on the areas to be treated. Apply 1 dose per application. Ideal for skin subjected to cosmetic procedures, burns, cuts and irritations.